Thanks to the wonders of the automotive paparazzi, we have known for some time that the Maserati Ghibli would soon introduce a new smaller sedan to the Italian sport luxury lineup but thanks to this morning’s press release which included the images on the right – we get our first official look at the new Ghibli. For those wondering about that name, a quick web search for Ghibli reveals that it is a word with Arabic origins that refer to a hot, dust-carrying desert wind in North Africa. Ghibli is also a popular form of Japanese anime but it seems like a hot wind is more likely what Maserati was going for in choosing that name. Today’s announcement of the Maserati Ghibli was fairly brief - talking more about what it means to the company than what it will offer the buyer – but there are a few choice details included. Most significantly, today’s announcement confirmed that the Ghibli will be powered by a pair of turbocharged V6 engines. The first will be a 3.0 liter gasoline twin turbocharged mill and the second will be a 3.0 liter turbo diesel engine – marking the first time that Maserati will sell a diesel powered vehicle. In addition to the pair of turbocharged V6 engines, the Maserati Ghibli will feature an eight speed automatic transmission and the buyer’s choice of rear wheel drive or Maserati’s new Q4 all wheel drive system. The decision to equip the Maserati Ghibli with a turbocharged diesel engine comes as a surprise to some but with the advancements in clean diesel technology (both in terms of efficiency and performance), the turbo diesel V6 could provide great fuel economy capabilities while also offering tons of torque for a sporty drive. This will almost surely be the most efficient model in the Maserati lineup but it will do so without compromising the performance driving spirit that is expected from the Italian sport luxury brand. As we can see in the three images provided of the new Maserati Ghibli (click any thumbnail on this page for a closer look at the gallery), the Ghibli will be a slightly smaller sedan than the Quattroporte but it still sports the distinct shape and design cues of the current Italian brand. In many ways, the Ghibli looks a great deal like the larger Quattroporte with an angry looking, headlight design that should fit perfectly in the Maserati showroom while also resonating well with shoppers in the segment. However, the Ghibli applies more of the aggressive exterior design from the GranTurismo range to the sedan form than does the Quattroporte. In terms of size, the Ghibli should compete with the likes of the BMW 5 Series, the Mercedes Benz E Class and the Audi A6/S6 sedans. On the inside, the sole picture of the new Ghibli is just as plush, luxurious and high tech as you would expect from a modern Maserati with plenty of contrasting soft touch leather surfaces on the door panels, the dash and the sport seats, a large infotainment screen, a high end sound system and lots of carbon fiber trim. We can also see an interesting steering wheel design with thumb cutouts for the paddle shifters that looks to be an awesome layout for the system. There is a close up shot of the steering wheel in our gallery and you can view that by clicking any thumbnail on this page. In addition to putting Maserati into a new segment in which it has not previously competed, the Ghibli could help bring new buyers to the brand with a lower entry level price. 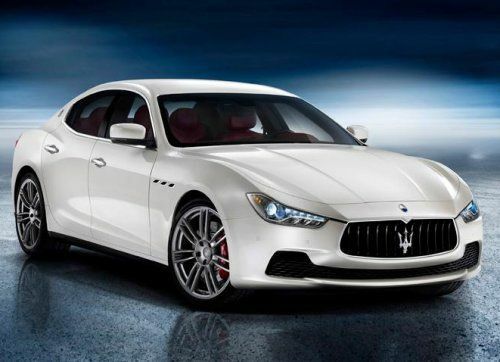 Right now, the least expensive option in the brand lineup is the GranTurismo S Automatic which starts at $123,000 while the least expensive Quattroporte starts at $127,250. The Ghibli will be smaller and likely less powerful than the Quattroporte so it would seem natural that the new sport sedan would have a lower entry price. The 2013 Auto Shanghai runs from April 21st to April 29th so we shouldn’t have to wait more than a couple weeks for the full details on this sleek new Italian sport luxury sedan.